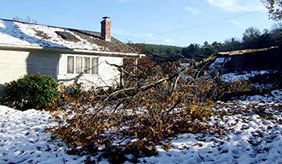 TREE SOLUTIONS is a reputable, professional tree service company that serves the Pioneer Valley in western MA. 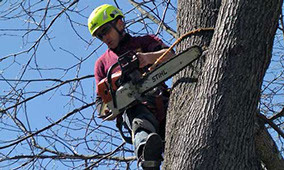 Our reputation in the industry is for excellence in tree cutting, removal, pruning and emergency service. We are known for our fast response to your request with reasonable rates. 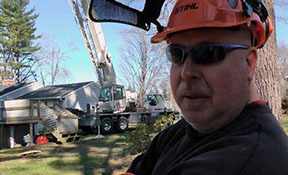 We have over 30 years experience in the tree service business. Few things are more frightening than the thought of a tree that presents a hazard to your home or business. The risk of this dangerous situation should be evaluated by a professional tree service as soon as possible. TREE SOLUTIONS has the experience in hazardous and emergency situations. We will tackle difficult jobs that other tree service companies do not want to handle. CONTACT US FOR A FREE INITIAL CONSULTATION & ESTIMATE! We realize there are many tree service companies out there. We want to earn your business... not just once but for the next time you need us or as a referral to your friends and associates. Your complete satisfaction is an important part of every job! Call us to find out why TREE SOLUTIONS is the tree service that people call and recommend. We are fully insured.
" Jeff, thanks for all the work you guys did. Tree Solutions came to my home for 2 full days after the huge winter storm of 2011. They removed dangerous trees and branches that I could not get to. All the usable firewood was cut into logs ready for splitting. Then they piled all of it neatly. They cleaned up the branches and dragged all the debris off the property. I was impressed with the crew who were very professional and courteous. Their work was fast and careful. I would not have a second thought to call you back if I needed you again." TREE SOLUTIONS is a BBB accredited business. Click the BBB icon for review.